In the 1860’s, the Wileman family were the owners of a large pottery known as the Foley Works located in Staffordshire, England. James B Shelley joined the Wilemans, became the head of the earthenware works and eventually ended up running the china works. In 1881 James then took his son Percy into partnership and after James’ death, Percy took over the china works. Percy employed the best artists and developed a world renowned bone china along with the well known Dainty shape (shown above). But in 1910, there was concern about using the name Foley, as Foley was actually a pottery region. By 1925, Percy had officially renamed his bone china Shelley. In the 1930′s Shelley also became well known for their Art Deco creations. They were even allowed to continue producing china throughout World War 2, unlike many other British potteries. The Shelley teacup shown above may be found by looking here in my Bella Rosa Antiques store. This one is in the "Dainty" shape (more adored than the others) and it has a scenic pattern called "Heather." Shelley teacups are more desirable because they were crafted of a beautiful, fine translucent bone china. They say if you are a teacup collector than you should have at least one Shelley in your collection. Come on, who's willing to fess up to their collection? I'd love to hear about yours. Jillian - you know I love this! If it's still there in November after pay day . . . be in touch! I have to say that Shelley is one of my favorites also. 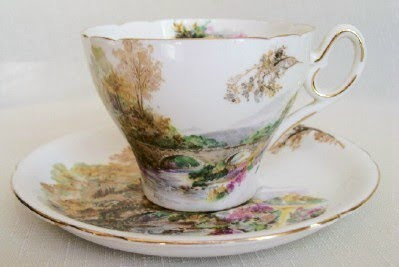 I love tea and beautiful tea cups. Thanks for the history of Shelley. Never knew this! I don't have a collection but if I did, I'd want one of these cups. So pretty! What a beautiful tea cup! You know so much about its' history. Wow!